Found one file extension association related to 18 Wheels of Steel: Pedal to the Metal and 1 file format developed specifically for use with 18 Wheels of Steel: Pedal to the Metal. 18 Wheels of Steel: Pedal to the Metal is truck simulation computer game for Windows. Take your show on the road. Drive your rig to make it big and build your business. Money talks - when you're in charge, let the drivers to their job while you count your cash. You're not only a trucker, you're a truck tycoon. STEP ON IT Stay one step ahead of the law as you rumble through crowded cities, past bustling sea ports and across rolling plains. 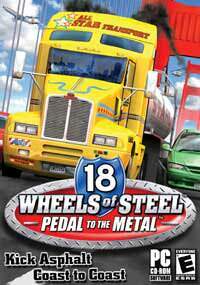 The 18 Wheels of Steel: Pedal to the Metal software seems to be old or discontinued. If you need more information please contact the developers of 18 Wheels of Steel: Pedal to the Metal (ValuSoft), or check out their product website.